WHY SHOULD YOU USE OUR ESOURCING SOFTWARE? Our competitive esourcing software pricing to help you started for as little as £500 per month. Never install or upgrade esourcing software again. Simply access anywhere through your web browser with our on-demand tool. 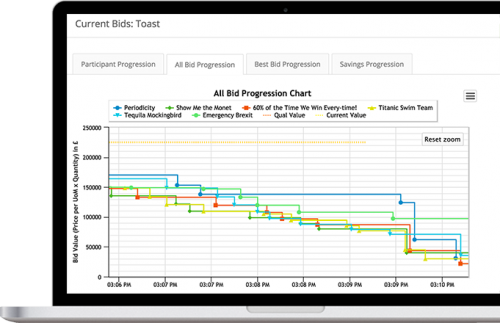 Run on-demand forward or reverse eSourcing and auction events to ensure that you are getting market price. Easily combine questionnaire scores with pricing to give an overall weighted score. Use our lot matrix functionality to allow both single and multi line item events that meet your requirements. Use sourcing event templates or clone events for repeatability. Pause, Terminate or Extend your events for full control. Request a consultation call or demo from one of our eSourcing experts and discover how you can run a perfect reverse auction. Use our expansive library of auction guides to boost your confidence. Just like instant messenger to answer any immediate problems. No premium rate support numbers here, just first-class experienced support.